Our self-destructive, repressed, and expendable cop protagonists, portrayed by the Farrell-McAdams-Kitsch triad, practice maverick techniques that border on impropriety but their ideals and values align them with the incorruptible Philip Marlowe and Sam Spade… naturally leading to the straight-out-of-pulp “last stand” holed up in a secluded motel room with seemingly endless bottles of whiskey. 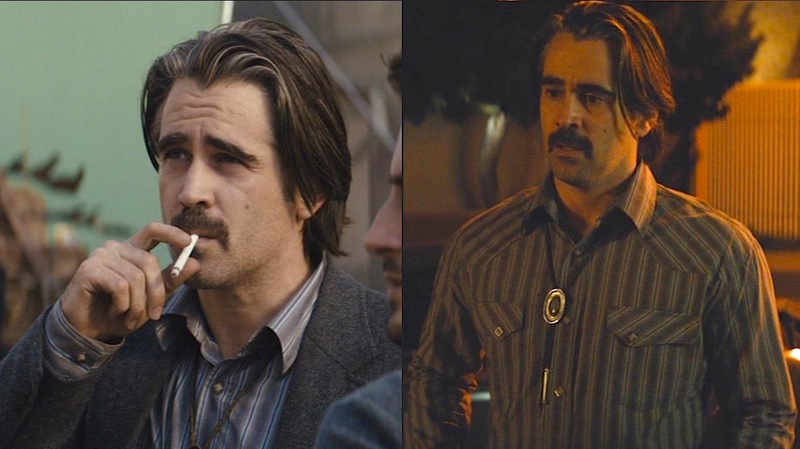 The second season of True Detective uses these seemingly cliched tropes we know – the hard-drinking, the smoking (Ani’s e-cig! ), the cynical promiscuity – to establish these cops’ “noir credentials,” so to speak. 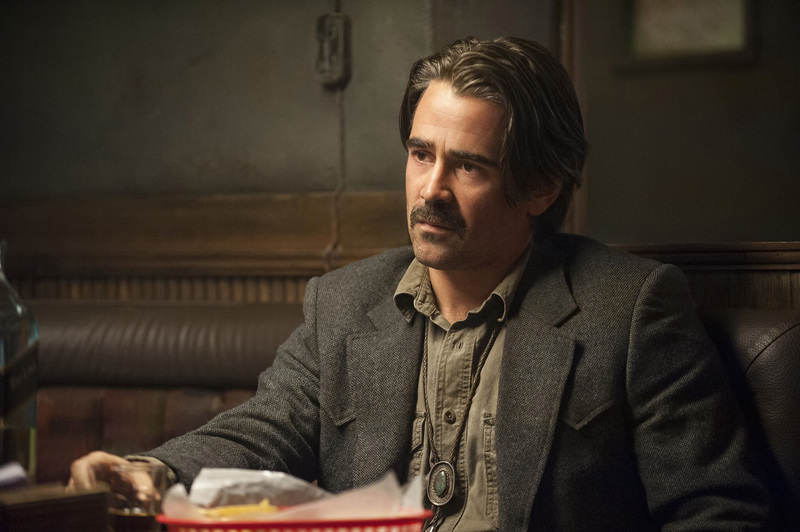 Much is made of the second season’s focus on defining, claiming, or reclaiming masculinity, so costume designer Alix Friedberg took inspiration from the most masculine of American archetypes – the Old West cowboy – when dressing Colin Farrell as troubled Vinci detective Ray Velcoro. 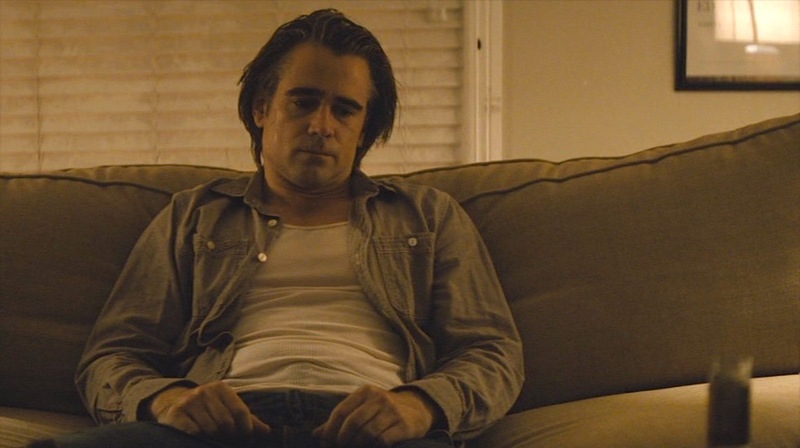 Ray Velcoro’s introduction to viewers mirrors the appearance of Rust Cohle in the first season, providing visual – if not narrative – continuity between the disconnected stories. A staple of Ray Velcoro’s rugged, minimalist wardrobe is a series of three earth-toned sport jackets worn over the course of the season, all very similar but with distinctly different styles. His most frequently worn of these three, worn for his first and last on-screen appearances and for many episodes in between, is this dark taupe ranch sportcoat with Western front and back yokes. This jacket features in nearly every episode except for the second and fifth. All of Farrell’s sport jackets were custom made for the production, though Friedberg recalled taking inspiration from “some classic ’70s and ’80s blazers that we found in the costume shops.” The same Costume Designers Guild article describes Friedberg’s process of obtaining fabrics from B. Black & Sons, a Los Angeles fabric wholesaler that’s been doing business since 1922. Comparing the B. Black & Sons catalog to screenshots of Farrell on screen seems to indicate that this particular was possibly made from a woolen tweed fabric referred to as “heather brown” by the company, further aged and dried by the costume department to create Velcoro’s desired look. “We wanted [Ray’s coats] to have the timelessness of a larger lapel and the fit of a coat that has been slept in day after day,” explained Friedberg, and Velcoro’s on-screen sport jackets certainly meet those ends. The show was produced at the height of the recent super-slim fashion trends for men, but Velcoro eschews it in favor of a more timeless, if baggy, direction. This particular single-breasted jacket has notch lapels of moderate width that roll to a two-button front, the most classic and timeless of all men’s jacket styles. It takes obvious inspiration from the classic Western ranch suit with its pointed front yokes (rather than a breast pocket) and double-pointed back yoke. The yokes appear to be sewn only at the top, casting a small shadow outlining the bottom of each yoke. The noir-ish lighting at the Black Rose Bar accentuates Velcoro’s semi-sewn jokes on his dark taupe jacket. The yokes are what make this jacket most distinctive, and Circle S appears to be the go-to purveyor of similarly styled ranch suits. The Circle S “Lubbock” suit jacket in “heather chestnut” is a fine alternative for Velcoro’s warmer brown Donegal tweed jacket worn in other episodes. Unlike Velcoro’s aforementioned brown Donegal tweed jacket, this jacket has no back pleating. The jacket also has a long single back vent, straight flapped hip pockets, slightly padded shoulders with roped sleeveheads, and three-button cuffs at the end of each sleeve. Ray and Ani during an investigation in “Maybe Tomorrow” (Episode 2.03). Ray Velcoro has a realistically limited closet for a man who cares little about fashion, often rotating through the same shirts with various outfits and situations. 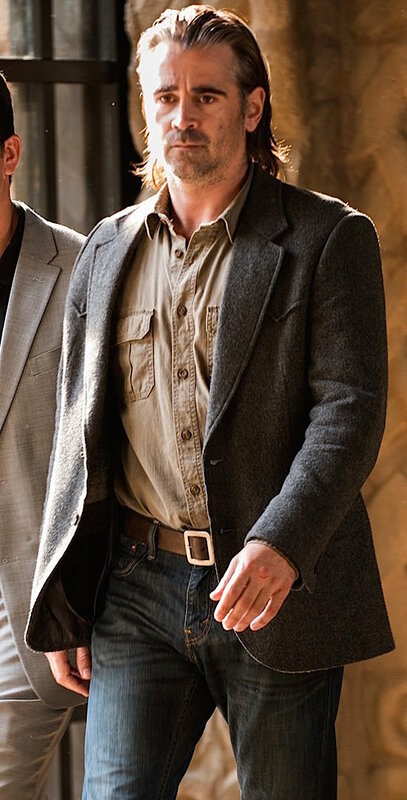 The shirt that Velcoro most frequently wears with this outfit (and with others, if I’m not mistaken) is a drab khaki work shirt like something you’d find at Eddie Bauer or L.L. Bean. In fact, the closest alternative I’ve found is L.L. Bean’s “Sunwashed Canvas Shirt, Traditional Fit” made from 100% cotton canvas in “sandstone” color (still available for $44.95 as of November 2017). 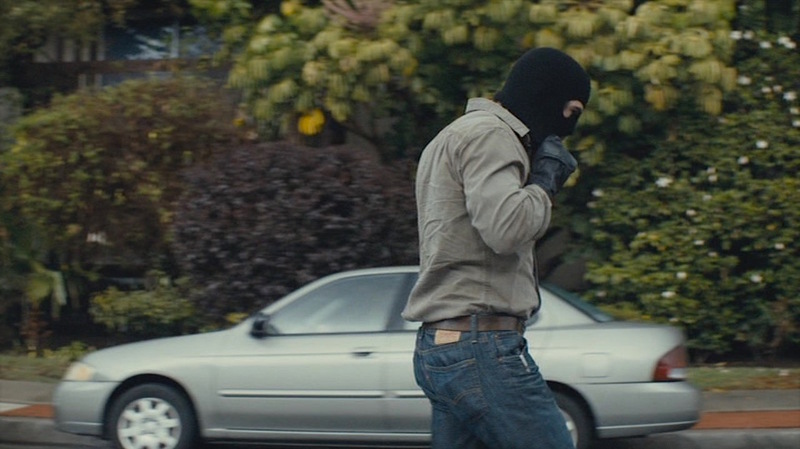 This large-fitting shirt – worn with this jacket in episodes 1, 7, and 8 – is consistent with Ray’s palette of washed-out earth tones. The shirt has two box-pleated patch pockets on the chest that each close with a single button through a mitred-corner flap. Each cuff closes on one of two buttons for an adjustable fit as well as a smaller button on the gauntlet that Velcoro typically leaves undone. All buttons, including the pocket flaps, the cuffs, and up the front placket, are brown urea plastic. 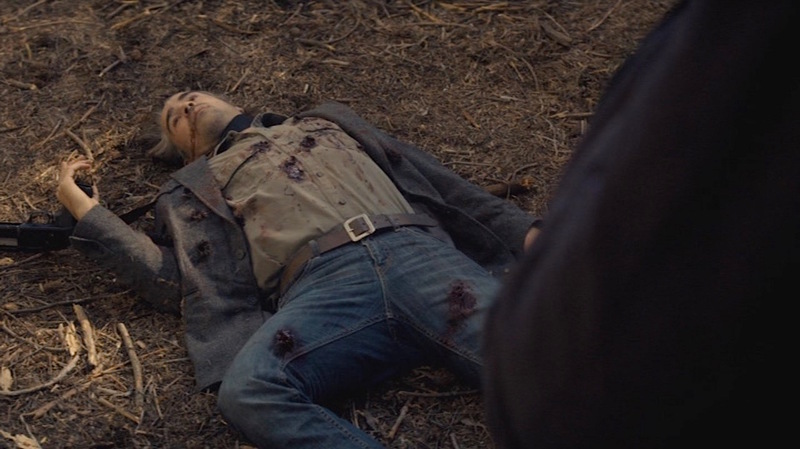 A boozed-up and bloody-cuffed Ray Velcoro visits his son Chad in “The Western Book of the Dead” (Episode 2.01). In “Maybe Tomorrow” (Episode 2.03) and the following episode “Down Will Come” (Episode 2.04), Velcoro wears his dark taupe ranch sportcoat with a striped snap-front shirt that made its first appearance with the brown Donegal tweed jacket. The shirting is a purple-gray ground intermittently interrupted by a series of a light gray-blue shadow stripes (each, in tern, bisected by a thin navy stripe). The shirt has Western yokes with single shoulder points that skew to the outside of the shirt (closer to the armpits), opposing the skewed and slanted pocket flaps that snap closed toward the center of the shirt. On these pocket flaps and up the front placket are large gunmetal lozenge-shaped snaps; there are also two stacked snaps on each cuff. Day and night in “Maybe Tomorrow” (Episode 2.03). “Church in Ruins” (Episode 2.06) features a cleaned-up Velcoro two months after the “Vinci Massacre.” The detective has resigned from the Vinci PD and is working private “security” as a glorified mob collector for Frank Semyon’s Vinci Gardens casino. In addition to his clean-shaven upper lip, the new role also finds Velcoro in a new light blue chambray shirt with a spread collar, front placket, two patch pockets on the chest, single-button cuffs, and double back side pleats. This is arguably his most “fashionable” shirt (and, indeed, LookLive reports that it was obtained at Nordstrom), though the chambray work shirt still has strong utilitarian origins on the decks of U.S. Navy cruisers in the early years of the 20th century. 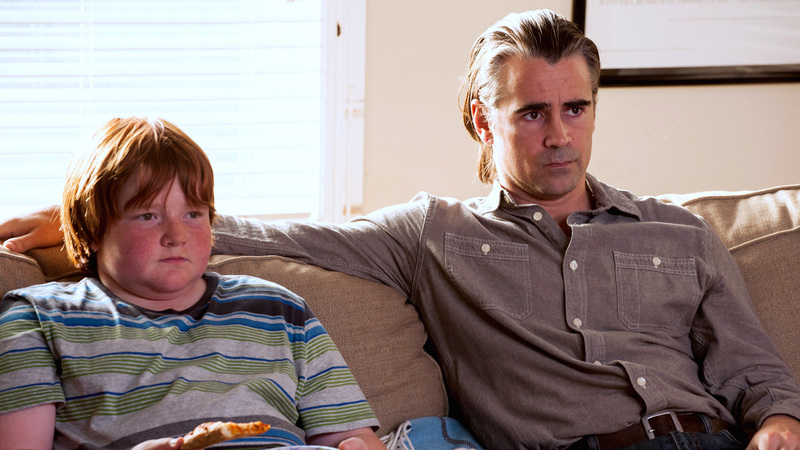 Promotional photo from “Church in Ruins” (Episode 2.06) during Velcoro’s visit with his son Chad (Trevor Larcom). The chambray shirt has large off-white plastic buttons that stand out against the solid material of the shirt. Each chest pocket has mitred bottom corners and as single button through the top to fasten it to the shirt. These buttons don’t fare so well during Velcoro’s drug-fueled binge in the same episode when he tears the front of the shirt open, leaving only the top three buttons intact. His dramatic gesture reveals his standard undershirt, a standard white ribbed cotton sleeveless A-shirt. Same episode, same couch, same shirt, albeit ripped open and having taking a few buttons casualty. On Velcoro’s tie, the bolo itself is a silver oval with a turquoise stone bordered by a silver braid, worn around Velcoro’s neck on a dark brown leather braided cord (lariat) that Friedberg likened to “a noose” with silver decorative metal tips (aiguillettes) at each end. 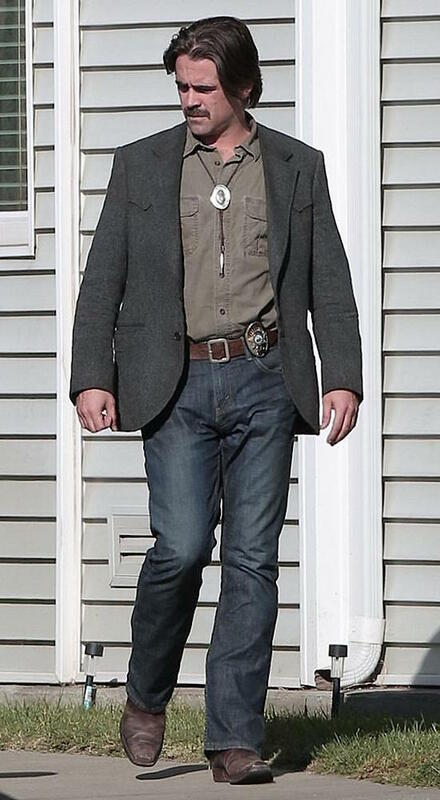 Ray wears his bolo slid considerably down on his chest, a less formal look consistent with his casual demeanor. 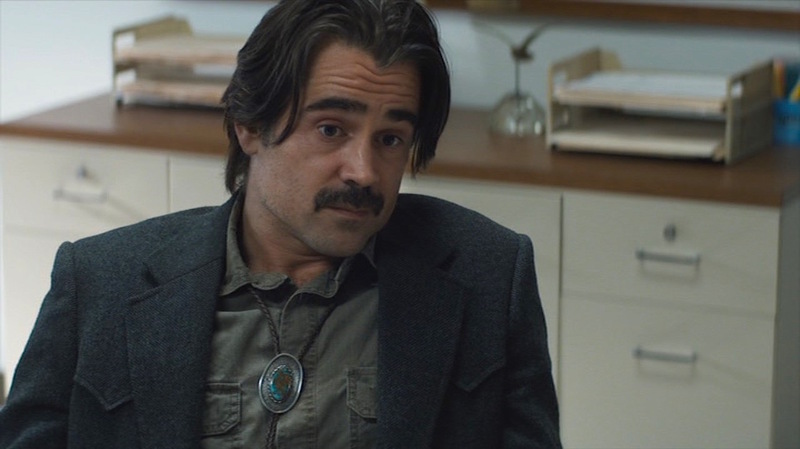 According to LookLive, Velcoro’s bolo tie is a product of Taos Indian Trading Company. And why would a modern man following a classic American cowboy aesthetic wear anything but Levi’s jeans? Ray Velcoro invariably wears Levi’s 501® Original Fit jeans in standard blue denim, with his knife clipped into his right side pocket. Velcoro wears a solid brown leather belt with a squared dull steel single-prong buckle. You paid heed to the spoiler alert at the top of the page, right? Velcoro meets his bloody end in “Omega Station” (Episode 2.08). When on duty, he wears his Vinci PD detective shield on the left front of his belt and a black holster for his Browning Hi-Power on the right side of his belt. After hanging up his badge, he also retires his police-issued holster and carries his Hi-Power in a tan leather inside-the-waistband (IWB) holster fastened to the back of his jeans with a black clip. 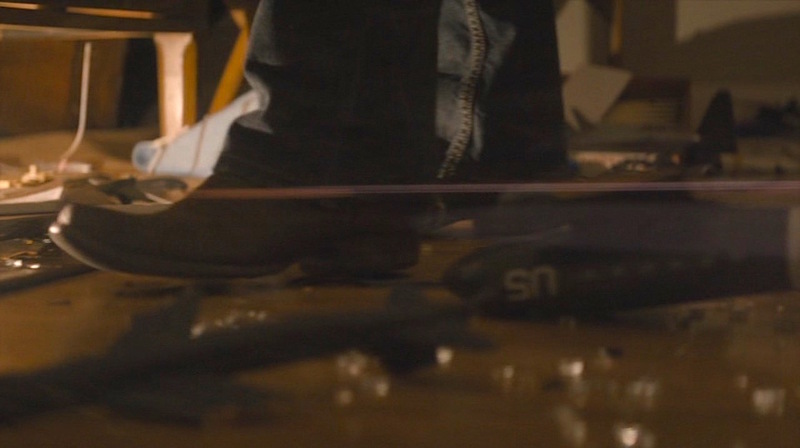 Velcoro steps through the wreckage of his model planes in “Church in Ruins” (Episode 2.06). 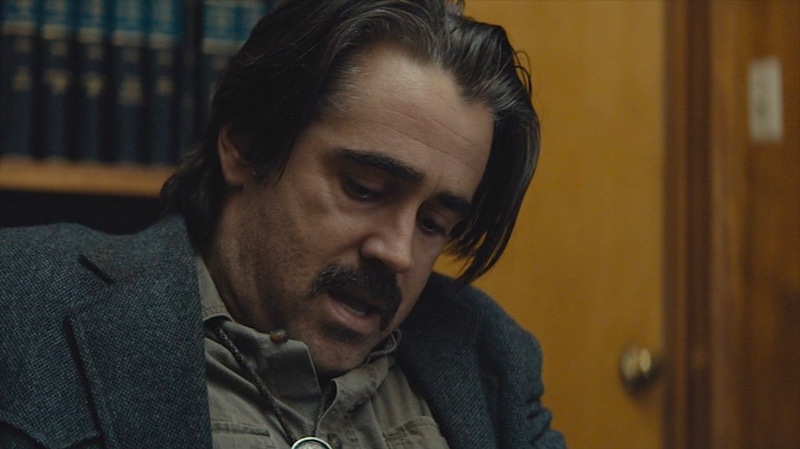 Ray Velcoro gives True Detective audiences plenty of glimpses into his boozes of choice, although his addictive tendencies are far from glamorized à la the early episodes of Mad Men. 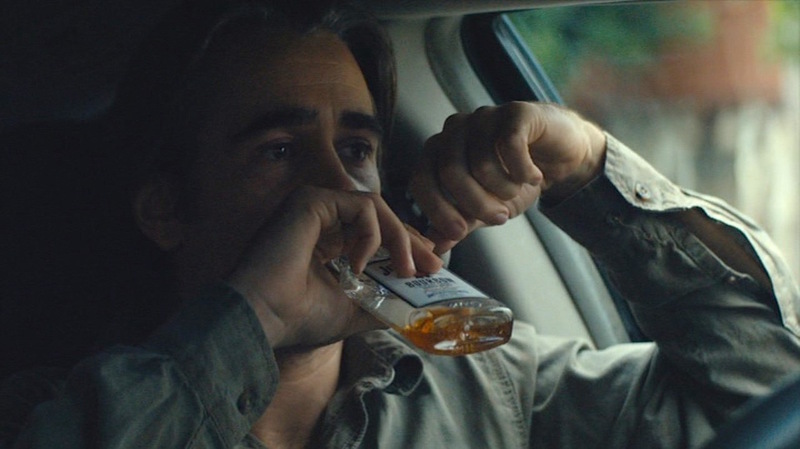 In the first episode, we see Velcoro sneaking pulls from a small plastic flask-type bottle of Jim Beam in his car… furtively, of course. Bourbon is Velcoro’s chosen hooch when steeling his nerves for a paid thuggery job in “The Western Book of the Dead” (Episode 2.01). 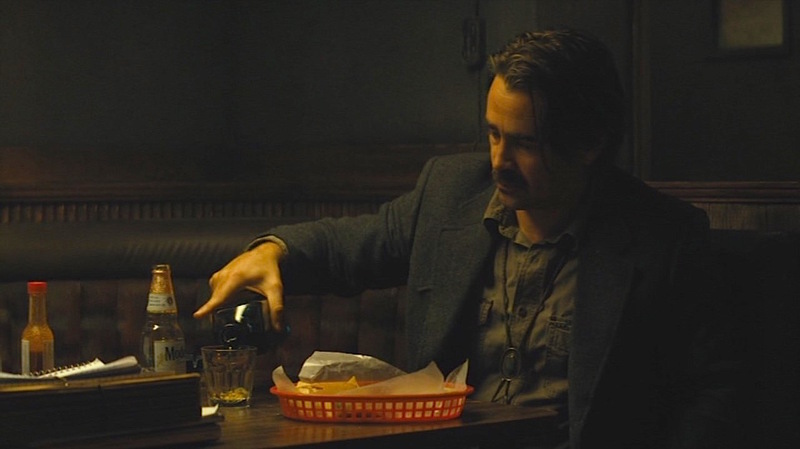 Later in the episode, we catch up with Velcoro at the Black Rose, enjoying one of several bottles of Modelo Especial, the Mexican beer that seems to be his brew of choice with its multiple appearances throughout the second season of True Detective. Velcoro double-fists $2.50 beer and $250 Scotch. 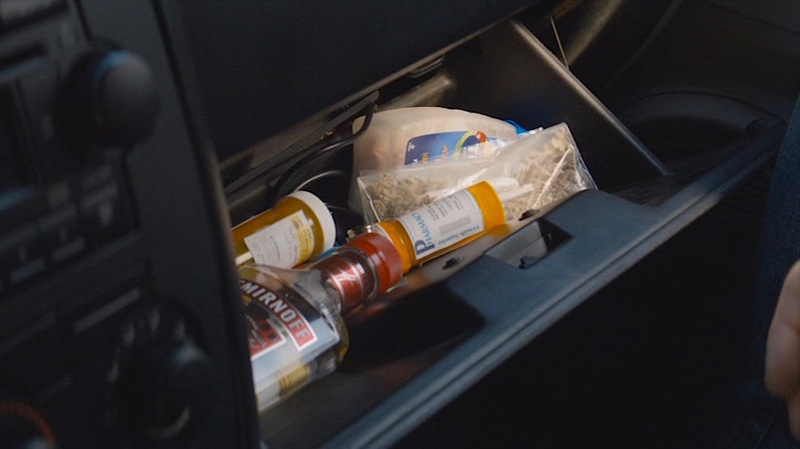 We learn in “Down Will Come” (Episode 2.04) that Velcoro keeps a portable hangover cure in his glovebox in the form of drugs, Tums, and a 375mL bottle of Smirnoff “Red Label” 80 proof vodka; in Paul Woodrugh’s time of need, he turns to the latter for aid. Following the Vinci Massacre gunfight later in the same episode – one of the season’s high points – Velcoro has cleaned up his act as a private citizen, presumably tossing his glovebox contents in favor of trying to win the approval of his son’s social worker. 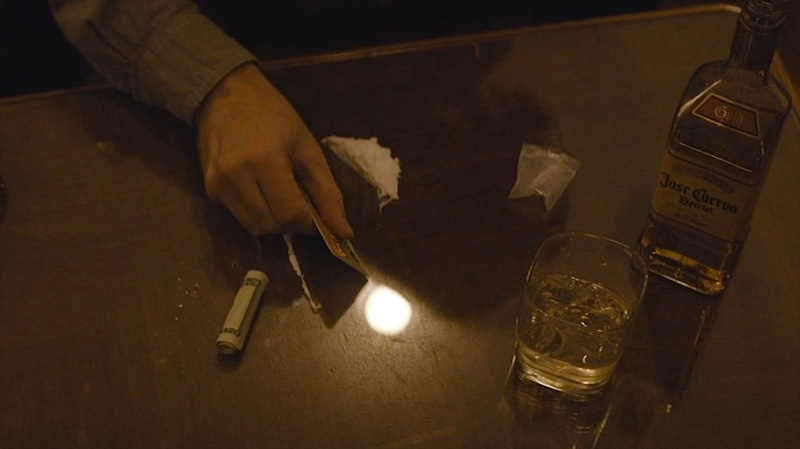 Of course, a tough custody visit sends Velcoro right off the wagon and he makes a quickie stop for enough drugs and booze to make Jim Morrison green with envy. The star of Velcoro’s drug-fueled binge in “Church in Ruins” (Episode 2.06) is a prominently placed bottle of Jose Cuervo Especial, further establishing moderately priced tequila as the elixir of choice when one is looking for a wild night to regret. Evidently, no real-life beer brands could afford to be associated with Velcoro’s debauched solitary bacchanal, and he is seen drinking a bottle with the fictional “Haber Kern” label, a product of Hollywood prop-maker Independent Studio Services. There’s little to admire about the “Church in Ruins” (Episode 2.06) binge other than the music, as the sequence is set to the badass “Human Being” by the New York Dolls, the closing track of their 1974 album Too Much Too Soon. Ray Velcoro takes his style cues from traditional (if slightly toxic) archetypes of American masculinity with Western influences from his jacket and jeans to his bolo tie and boots. Ray Velcoro’s chosen sidearm, both as a Vinci PD detective and his “private” life to follow, is a classic Browning Hi-Power in blued steel with walnut grips. 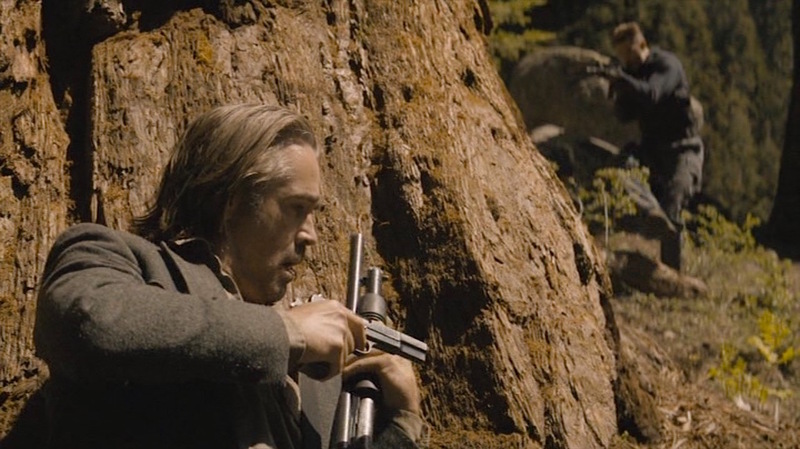 He carries the Hi-Power holstered, first in a belt holster and then an IWB after he resigns from the force. The Hi-Power differentiated itself from other semi-automatic pistols of the era with its then-revolutionary double-stacked magazine, designed by Dieudonné Saive to increase the capacity to 13 rounds of 9x19mm Parabellum ammunition without substantially increasing the size of the pistol. The first of the “Wonder Nines”, the Browning Hi-Power and its various clones and adaptations continue to be used today. One of the design changes over the Hi-Power’s production history replaced the former single-hole “ring” hammer with a more traditional flat hammer as found on the classic 1911 pistol. This change, among others, was implemented in 1973 and all following pistols to be produced are referred to with the unofficial “Type 73” designation. With its external extractor and flat hammer, Velcoro’s Hi-Power is clearly a Type 73. Velcoro, armed with his own Browning Hi-Power and Frank Semyon’s Mossberg 500 Cruiser, takes cover in the final episode, “Omega Station” (Episode 2.08). Cornered by a team of mercenaries and corrupt cops in the final episode, “Omega Station” (Episode 2.08), Velcoro takes to the hills with Frank Semyon’s recently purchased Mossberg 500 Cruiser shotgun for backup. The standard Mossberg Model 500 was introduced in 1960 as a competitor to the popular pump-action shotguns produced by Ithaca, Remington, and Winchester. Mossberg has produced many variants of its successful Model 500 design over the years, and it is the Model 500 Cruiser with its factory-installed pistol grip that Velcoro slings over his shoulder for his last stand in “Omega Station”. 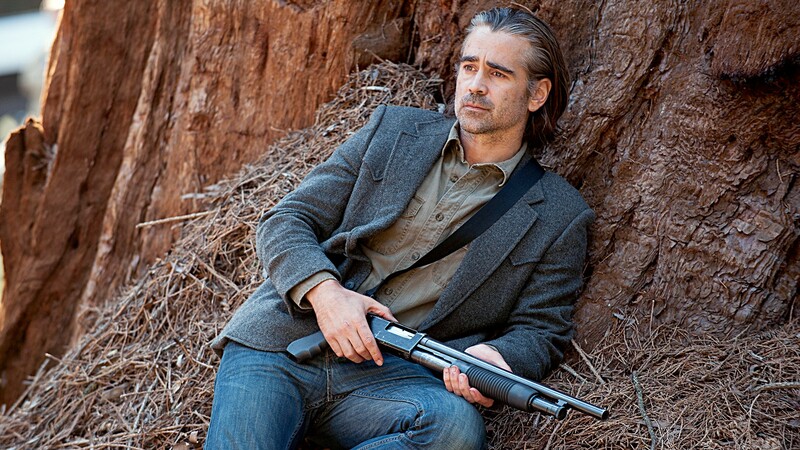 Promotional photo of Colin Farrell as Ray Velcoro, armed with a shotgun for his last stand, in the final moments of True Detective‘s second season. 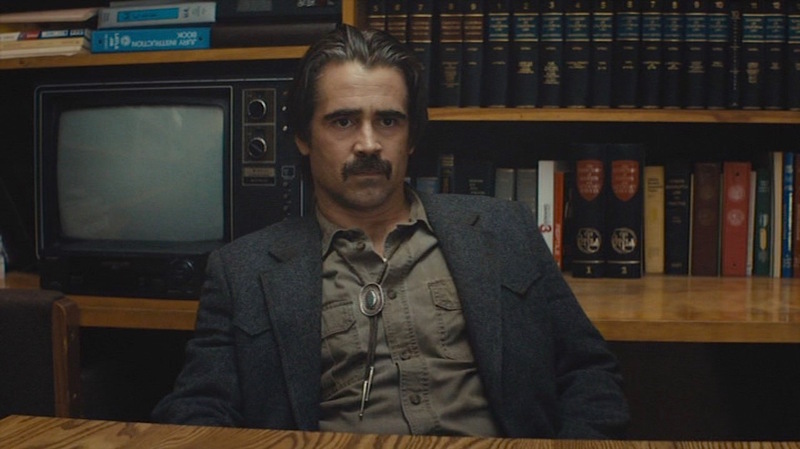 Give the second season of True Detective a chance… but you should definitely watch season one. I was never big on runnin’. Holy crap, I always wanted to suggest this, but I didn’t know how you felt about season 2. I’m glad I found someone else who can enjoy it for what it is: a classic, dense noir story. Great post! Yours was a refreshing comment to read, Jeff! I had a similar fear that posting about this season would lead to a backlash from folks who didn’t like it. I enjoyed season 2 a lot more during a second viewing with the noir context in mind. I’d say the last two and a half episodes provided some of the better twists, thrills, and suspense that I’ve seen in recent TV! There will be some more posts ahead about Ray Velcoro; I think I have the denim Wrangler trucker jacket slated to be featured next. Thanks for writing! Do you mean the “denim sandwich” and straw hat he wore in the finale? ‘Cause I thought that was kind of cool. 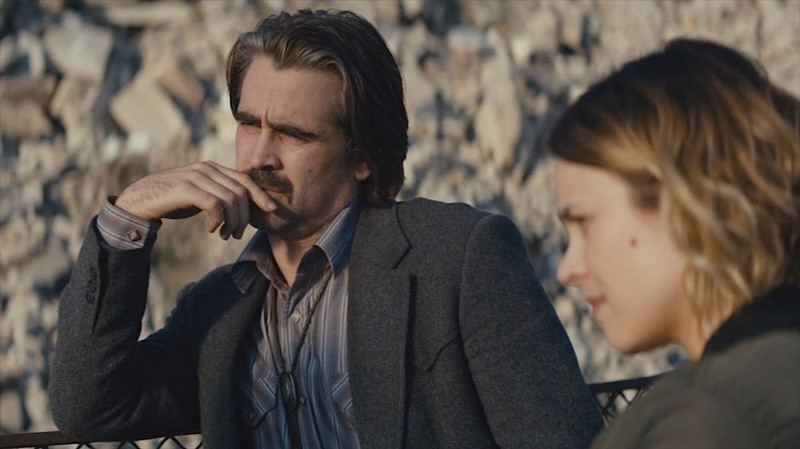 And on the subject of True Detective, is there any hope for a post on Rust Cohle?